At 32, the much-heralded guitarist Joe Bonamassa is still very much a young man - yet, he's marking his 20th year in the business of recording and touring this year. It's true, Joe has been hammering away at it for two decades now - and with the recent release of his 7th album, The Ballad Of John Henry - all his hard work is paying off nicely as he's hitting stride with multiple career milestones in 2009 -- including jamming with a mentor on his home turf. 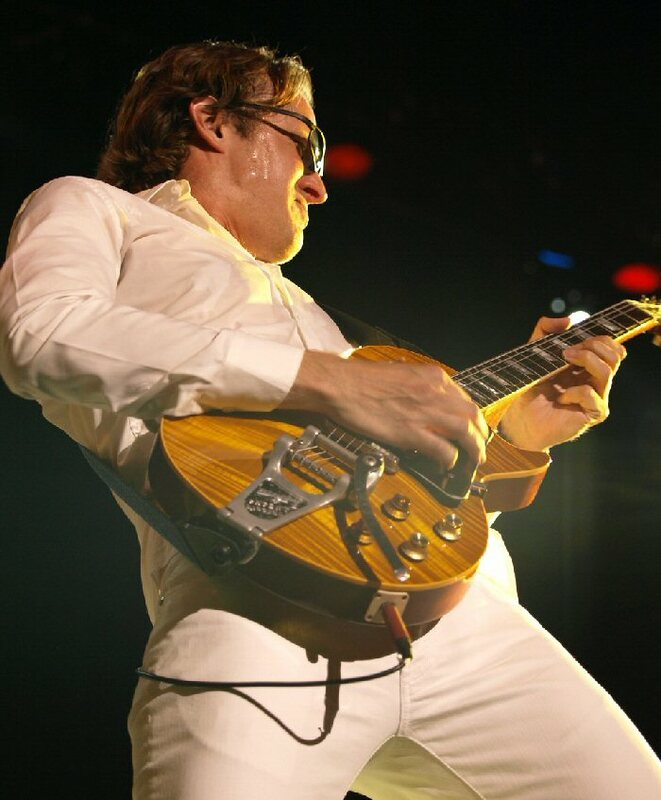 Joe Bonamassa is a well respected blues rock guitarist who mastered the instrument as a youngster. At age 11, Bonamassa was briefly schooled by Danny Gatton who led the prodigy through country, jazz and hard rock. By age 12, Joe was opening for the legendary B.B. King. Overall, he cites the English blues masters as his greatest source of inspiration and he has had the pleasure of playing with two of them - Eric Clapton and Steve Winwood - on his current tour. Besides B.B King and Slowhand, Bonamassa points to additional artists from the British Isles as major influences including John Mayall and Rory Gallagher. Joe blends traditional American blues with the more mainstream, technical type of blues made popular by the likes of Jeff Beck and Jimmy Page. 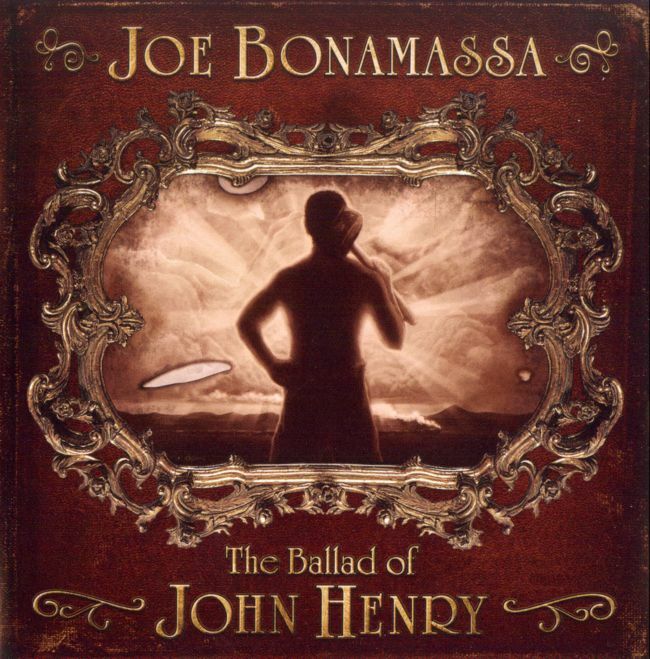 The Ballad Of John Henry is Joe's seventh studio release and his fourth consecutive album produced by Kevin Shirley. His newest CD features twelve tracks exploring a range of styles such as British blues, Delta roots and swamp. In addition to Joe's instrumental voodoo the CD showcases his vocal range and storytelling. Joe is a journeyman playing close to 200 shows a year. 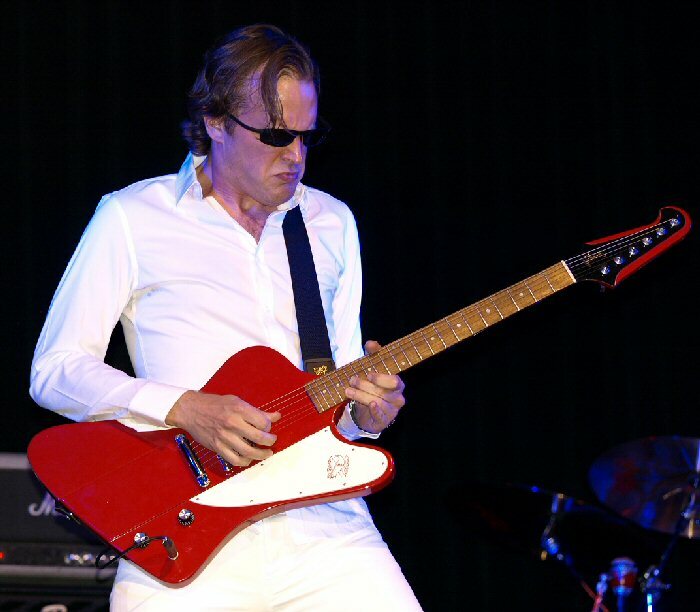 Bonamassa will be on tour throughout 2009. One of his stops included a show at the BergenPAC in Englewood, New Jersey on August 12,2009. Prior to the concert, Joe hosted a guitar clinic for the local chapter of the School of Rock and ticket holders. The BerganPAC stage was stacked with amps and lots of gear as Joe - clad in all white and armed with a Firebird - started off with a blazing version of Blind Faith's "Had To Cry Today". The bass lines were lavish and layered well with Bonamassa's sizzling solos. "So It's Like That" was lush with fluid fret work and colorful keys floating to the top of the mix. "Last Kiss", which is on his new record, was an up-tempo bluesy number. Joe utilized a technique of dragging and plucking his thumb over the stings for denser sounds. The rhythms were daring and drove the song through more jaunting jamming. "So Many Roads" was a journey exploring versatile vocals and Joe's renowned musical magic. The piece was played with passion and precision with Joe pulling long phrases from the strings of his Les Paul guitar. From the night's first note to the last the audience was spellbound by the shamanic Bonamassa's ability - clearly wielding power from his instrument. Bonamassa's band was tenacious and tight adding more punch to Joe's tasteful and technical tunes. Joe took a few moments to greet the audience and mentioned his recent and momentous gig at England's prestigious Royal Albert Hall, which included an appearance by Eric Clapton. Then, guest drummer Anton Fig (who was with Joe at RAH) came out to play on "Lonesome Road Blues". It was filled with lively licks and blistering blues tones with extensive instrumentation. "Happier Times" started off soft and sweet with subtle speed changes with more stellar string work from Joe. The beats were beguiling as the piece moved from moody to magical. Bonamassa's cover of "Further On Up The Road" was energized and engaging with expansive jamming. It was followed by the smoky "Great Flood" which featured seamless solos and solid rhythms. Carmine Rojas and Rick Melick of the Joe Bonamassa Band. Joe played a number of guitars throughout the show including an acoustic. Joe was alone on the stage as he picked animated textures and tones from his six-string. Joe's colorful and concise phrasing with classical tones got a standing ovation. The band returned and Bonamassa playing a flying V and blasted through "Just Got Paid" with a dazzling side trip into Led Zeppelin's "Dazed and Confused". The encore "Ball Peen Hammer" was performed on the acoustic with the keys adding accents before the drum and bass melded into the mix. Moving into "Mountain Time" Bonamassa and his band meandered from haunting to hallowed and closed the set in blistering fashion. Opening for Joe Bonamassa was Stretch featuring Glenn Alexander (guitar & vocals), Dave LaRue (bass) and on this occasion Bill Eldred (drums). The power trio played a strong set that spanned various speeds and styles with succulent jams. Of particular note was a tune called "F5", which featured thunderous drumming, furious fret work and blustering bass lines. The pieces had various pacing and stormy solos.